This house was the home to 4’11” tall Sarah Winchester, wife of the millionaire gun magnate William Winchester, from 1884 until her death at 84 in 1922. During this time she spent the equivalent of $70 million, constructing the house 24 hours a day, 365 days a year, because a medium told her that the spirits of the people who had been killed by Winchester guns would murder her should she stop. The house is remarkable in its total utter lack of any plan, during daily consultations in the “séance room”, spirits would help her map out the plans for the following day’s construction – and boy does it show. There are 160 rooms, 40 bedrooms, 47 fireplaces, 10,000 window panes, 6 kitchens, 40 staircases, 13 toilets, 1 shower and 3 baths for the 3 people who lived in it (excluding servants) most of it without rhyme or reason. The place is filled with architectural anomalies – stairways that go nowhere, cupboards that are impractically 1 inch deep, doors that open on to solid walls and windows that look out directly to the next room. On top of these, her favourite number 13 plays a big role and is conspicuous in the house; 13 coat hooks in the cupboard, 13 lights in the designed-for-12 chandelier, 13 stones inlaid in the priceless Tiffany windows and every Friday the 13th a large bell on the property is rung 13 times at 13:00. The theory postulated is she was trying to confuse the sprits, but after the visit, my theory is that woman was just plain nuts and the spirit architects were con-men from the local builder’s intent on selling her more wood. Architectural nightmare, but worth a visit. So one afternoon, sitting at my desk, I got an email-invite for “achieving work-life balance by shooting things”, which naturally piqued my interest. So I replied in the affirmative and entered it in to my calendar. On the allotted day we drove about 40 miles south of Mountain View and met-up with Steve, your archetypical huntsman, with busy beard and weathered face. He said little, smiled and handed us some big guns and some bullety-type things. With that we mounted on our golf cart and trolled off to the first station, impatient to use them. At each of the 18 stations you are confronted with a challenge, and #4 was the one for beginners. Under Steve’s expert eye we learned much in a short period of time, how to hold, aim, fire, safety procedures and terminology. All that was left was to do was shout “pull” and try to remember everything we had just been told. Needless to say it was difficult to put all in to practice and after a disastrous first 6 shots, missing every one of the seemly supersonic bright orange discs (supposedly representative of a bird), we sheepishly moved on the next station. This was even more taxing – shouting “pull” resulted in a grey, round target being ejected to roll across the floor, representing a rabbit. This time I was using my other eye and did manage to bag a couple, thanks also to Steve’s instructions. From there things got better, using my supposedly weaker eye and moving carefully, my hit rate went up considerably, resulting in a 80% hit rate at the last station. It was a great day and the humongous bruises that bloomed colourfully in my upper chest the next day were well worth the effort. Being in America, it gives you the excellent opportunity to travel around and meet up with some good old pals, who you have not seen for far too long. The first of such trips was to visit Stacey, living high in the mountains near Phoenix, Arizona in a place called Show Low (almost 2,000 meters in elevation). The place was named after an incident where two rival ranchers bet the ownership of the town on the turn of the lowest card. One rancher showed the lowest card when he cut, took ownership of the town and renamed the main street posthumously after his card, “the Deuce of Clubs”. Stacey, and the rest of her family, have a pendent for finding weird and wonderful abodes and this was no exception. Just trying to Show Low was an adventure. The plane from San Francisco to Phoenix was pretty small, the plane from Phoenix to Show Low was tiny – 11 passengers with an open view in to the cockpit, the pilot, and beyond. There was no stewardess, so the woman sitting behind me (Diane) opened up a big box of home-made cookies and started handing them round in lieu and subsequently hooked up with her neighbour on the plane to get a lift home. Arriving in Show Low it reminded me of an Australian cattle ranch – miles of barren nothingness, except for about 30 plane-spotting elk hanging around at the end of the runway looking, unsuccessfully, for something to do. And how much there is to do in Show Low, there is bank, a shop and a drive in restaurant where the waitress come out in roller-skates and bring the food to your car door and errr, that’s about it. Starting to doubt the appeal of such a place, it became clearer as we reached Stacey’s home – aka “The Cabin”. This is a bit of an understatement, a stunning log house set in beautiful grounds, crystal clean air and pure nature all round (nice Disney-type nature, not the annoying bitey-bug-type) – it was epitomized by the humming bird that whirred up to my balcony door to check out what was going on and the skunk that waddled past us after leaving a charming restaurant that night (for clarity, we had left the restaurant, not the skunk) – I was, rather ungraciously I thought, forbidden from petting it. The followed a couple of days rest and relaxation, visiting the sites around Show Low. 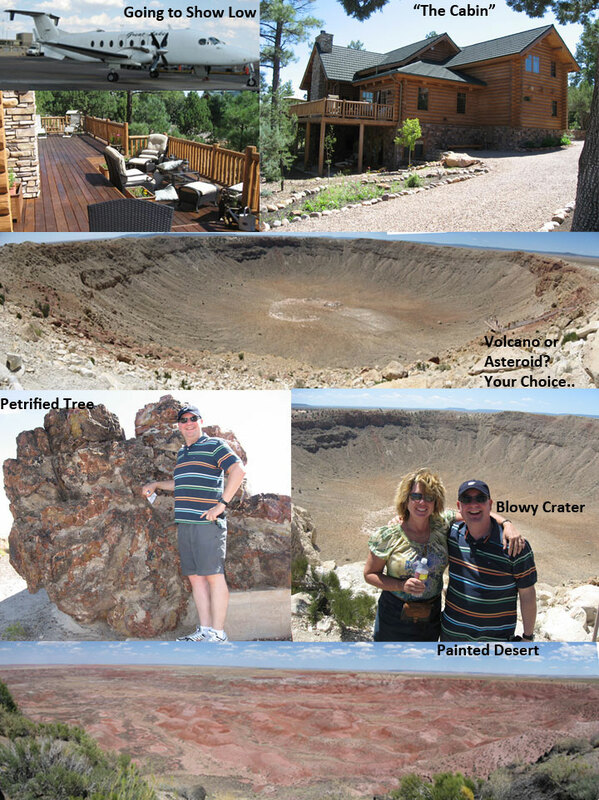 Well, once again, the nearest “site” is about a 2 hours drive – the Barringer Crater. Formed about 50,000 years ago, it is about 1,200 m (4,000 ft) in diameter, some 170 m deep (570 ft) and was formed when a 50 m wide iron chunk hit the ground at about 12 km/sec (29,000 mph) and vaporized instantly. Up until 1906, it was thought the crater was caused by volcanic activity. Then, in 1906, Daniel Barringer appeared on the scene and proposed the crater was caused by a meteorite. This theory was met with scepticism and he sought to bolster his position by locating the meteorite, which he presumed was buried deep under the crater. Unsurprisingly, he did not find it and eventually Barringer’s money and life ran out, but his family still own the land and there are some big holes at the bottom of the crater that act as a testament to his work. It was very windy at the crater and from there we battled the air currents to the next site – the Petrified Forest, 2 hours down the road. The Petrified Forest National Park houses the world’s largest collection of turned-to-stone Triassic conifers. The trees were buried in silt and over a period of about many years turn to stone. Elements in the silt such manganese, iron and copper penetrated the wood and gives it a variety of (earth tone) colours. These elements also coloured the rock strata to give the park its other name “the painted desert” – bit of an exaggeration if you ask me, but boat loads of tourists can’t be wrong. Sadly, my time in Show Low was too short, but the gods conspiring to keep me there. My flight to Phoenix was badly delayed which meant sitting, hungry, in the shack that is Show Low airport. Luckily(? ), my connecting flight to San Francisco was cancelled, resulting in my having to spend a night with another 199 pissed-off passengers in Phoenix at a hotel 20 minutes from the airport. This needed some quick thinking – the shuttle to the hotel could seat 12, and with 90 people waiting on it, in 32°c heat, 8 of us bypassed the wait, hired a stretch limo (at $7 a head) and got to the hotel first, bagging the best rooms and booking the optimal slots for the morning shuttle. A great adventure which I will repeat before my return to the Fatherland. This entry was posted in Postcard from the Edge and tagged Postcard from the Edge. Bookmark the permalink.